Liberal ideas on the Bellingham campus were put on trial during the 1930s. PERHAPS IT IS the location. Up in the “Fourth Corner” of a state that itself occupies two national margins, news from Whatcom County needs to rank fairly high on the shock meter to attract attention. Accordingly, headlines emanating from Bellingham and its typically even-quieter mainstay, Western Washington University, are few, far between — and often jarring. Case in point: Last November, classes were canceled for a day after an anonymous online poster — later identified as a university sophomore — made racially charged threats against WWU’s student body president, who is African-American. Western was uncharacteristically, and uncomfortably, thrust into a national discussion about campus racism. In the Seattle area, people seemed surprised that raw vitriol of this sort was coming from an uber-liberal town and laid-back campus with more of a rep for producing top-flight snowboarders and indie filmmakers than radical race-baiters. That’s understandable, taking the short view. But Bellingham’s most-recent, decades-long stretch of relative civic tranquility belies the vituperative political passions evident in its formative years. Like other places along Puget Sound, Bellingham’s working waterfront, which pumped logs and salmon into the world’s extractive-resources pipeline for a century, was long a breeding ground for political radicalism — on both sides of the spectrum. For most of its frontier years, the lumber-and-fishing town, carved from old-growth jungle in the 1850s, was a far cry from its present microbrewed mellow. Rumrunning and border-smuggling of people and goods were rampant during Prohibition. Labor strife and racial harassment of workers from Asia left century-old pockmarks on city history. 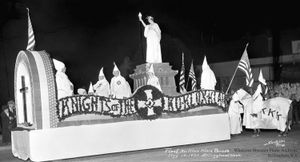 And until the early 1930s, the city and county were notably fertile grounds for the Ku Klux Klan — long after that movement’s “first wave” had faded from view in most other places. But mostly forgotten is a fascinating clash of ideologies that created, in Bellingham, one of the most significant, and least-documented, political scandals in Washington state history: the localized “Red Scare” campaign that forced Charles H. Fisher, Western’s president and a true national higher-education trailblazer, from office in 1939. Fisher’s ousting, ordered by Gov. 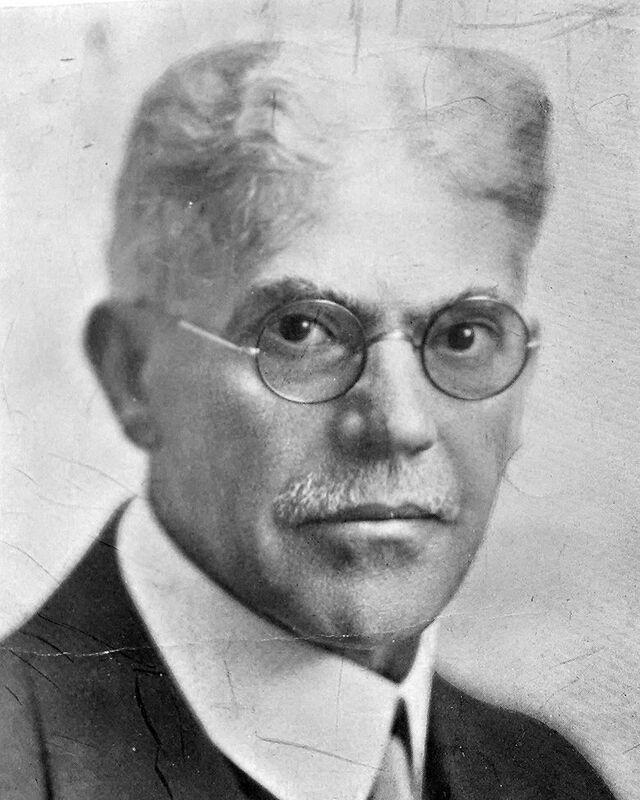 Clarence Martin over the objection of college trustees, students, faculty and most of his own political party, dominated Seattle headlines for days. But after Fisher left, wounds eventually healed, and the story was relegated to boxes in local archives. Reopening those old boxes — and a couple new ones — provides an unusually candid glimpse into the way some of our forebears reacted in a time of fear, in this case exemplified by Depression-era political upheaval. The Fisher story also speaks to the Northwest’s ingrained political extremism — not just the widely known, leftist brand that earned the state the nickname “the Soviet of Washington” a century ago, but the less-studied, archconservative counter-response that still clings in some crevices of western Washington’s political bedrock today. 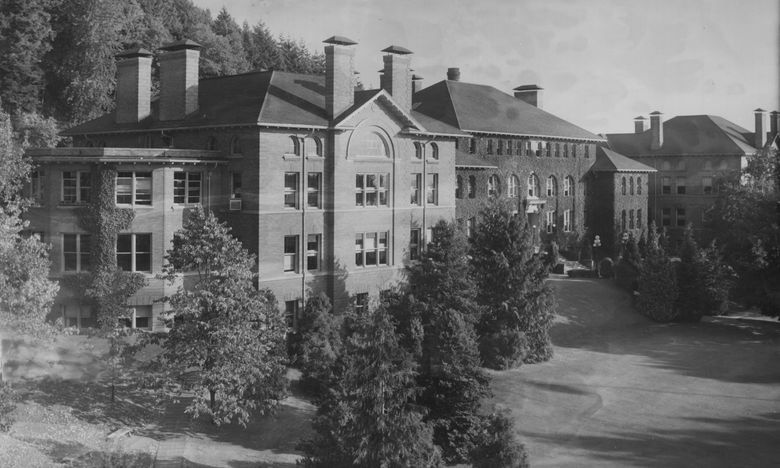 FISHER MADE his way to Bellingham in 1923, hoping to escape the stodgy political climate of the East and make the Bellingham school, one of the state’s three “Normal” (teacher-training) campuses, into a progressive-education beachhead in the Western states. Over a decade, he did exactly that. 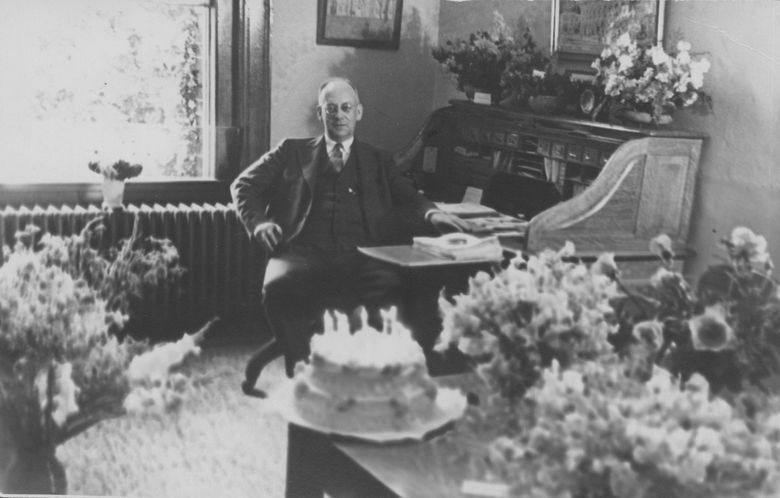 Attracting top-notch young faculty, many from the East Coast, Fisher’s school flourished, as much as any state-supported endeavor could during the Depression. 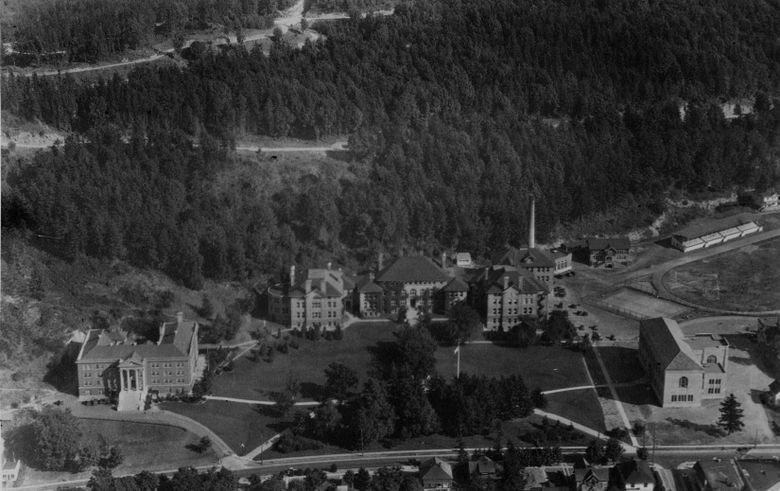 By the early 1930s, faculty and a student body of about 1,300 on the woodsy hilltop campus were intensely loyal to Fisher. 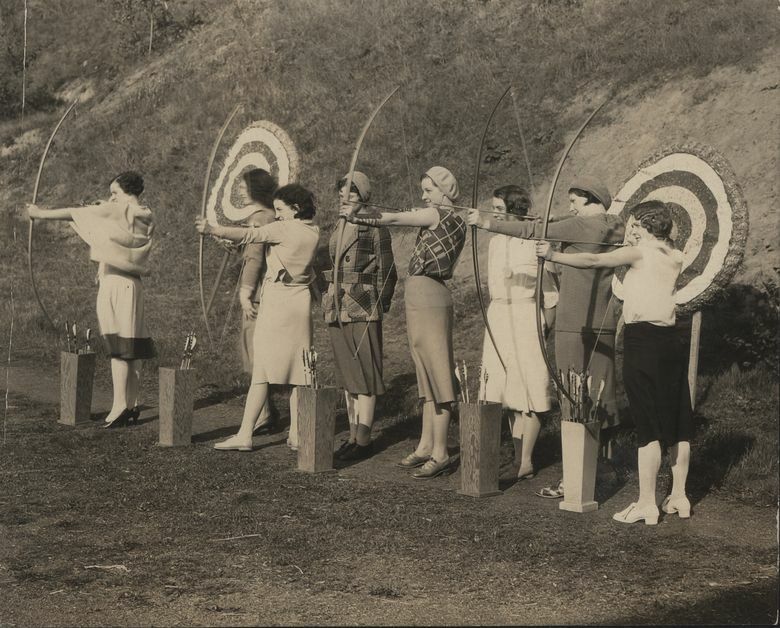 The rigor of Fisher’s ever-expanding curriculum was balanced by an unusually rich palette of idyllic distractions, from horseback riding and archery to the fine arts, beachfront salmon bakes, climbs of Mount Baker and surrounding peaks, and recreating in the San Juan Islands. It seemed too good for its time, and perhaps was. 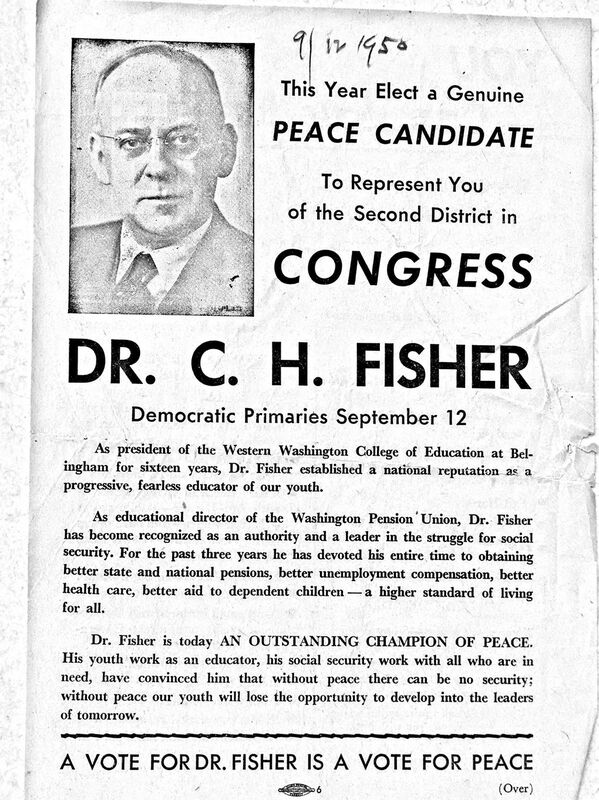 In 1935, a group of “pro-America” Bellingham archconservatives — many still smarting from being swept from power, for the first time in state history, by the long coattails of Franklin D. Roosevelt’s 1932 presidential victory — publicly branded Fisher a closet communist, atheist, pacifist and promoter of “free love.” The ringleader was Frank Ira Sefrit, manager and editor of The Bellingham Herald. Sefrit, an old-school newspaperman, for decades ran the newspaper and, essentially, the Republican Party, from the same Bellingham office. He had a reputation for using his clout to publicly destroy political opponents — usually with some glee. 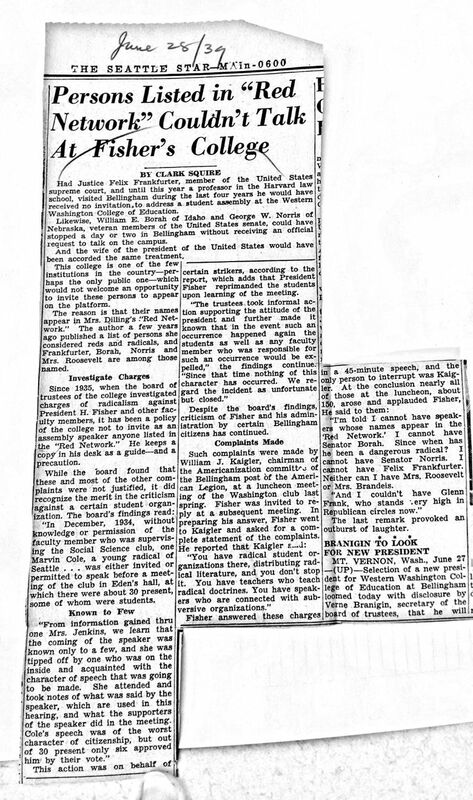 His anti-Fisher group, The Committee on Normal Protest, a mix of businesspeople, clergy, professionals and one self-proclaimed Grand Dragon of the KKK, finagled a private hearing on 10 formal charges against Fisher before the college board of trustees on May 22, 1935. In a closed meeting lasting nearly five hours, three trustees heard the arguments, and swiftly thereafter dismissed them all, proclaiming full confidence in Fisher. 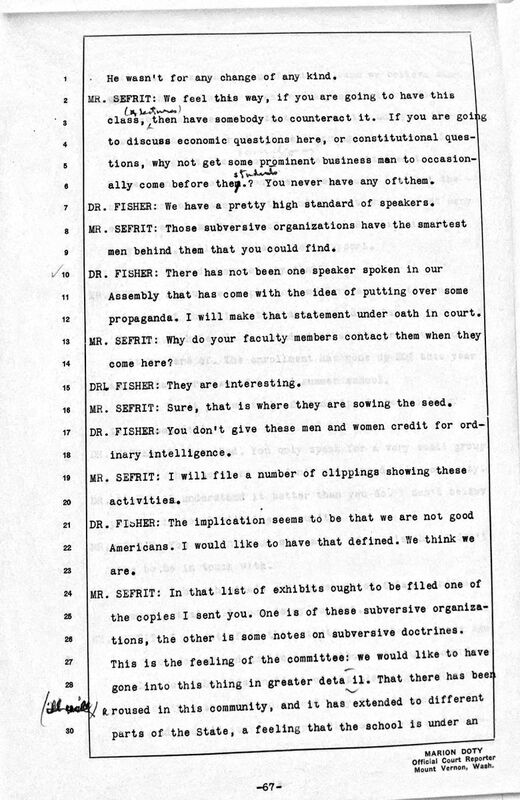 Undaunted, the Sefrit group continued to lobby Gov. Martin, a conservative Democrat, until the governor finally delivered an ultimatum to trustees in late 1938: He goes, or you go. Charles Fisher’s unceremonious ouster at the end of the 1938-39 school year made big, but brief, headlines in Seattle newspapers, including The Times. The move by Gov. Martin was decried by the state’s entire congressional delegation and many national educational leaders. But the furor faded quickly as the school worked to re-establish goodwill in Olympia, leaving important details of the case lost to time. 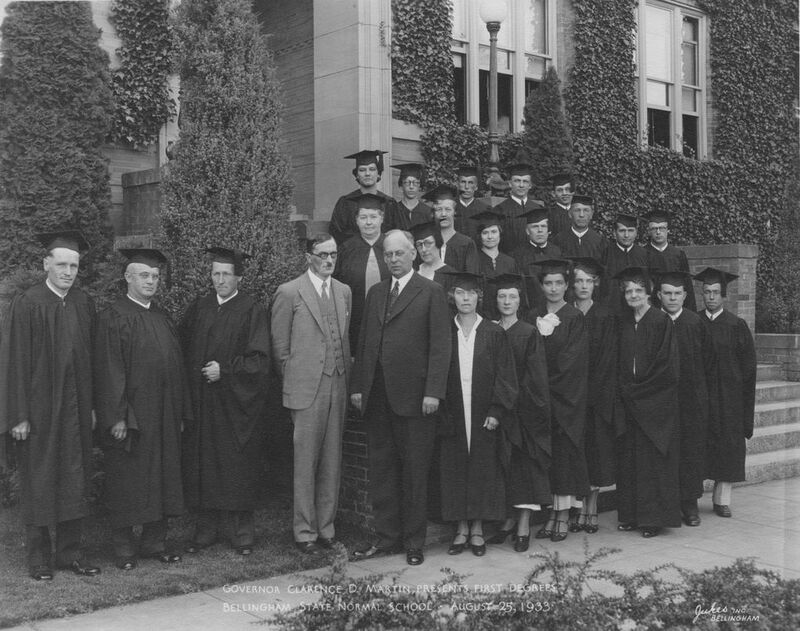 The trustees caved, sending Fisher packing at the end of the 1938-39 school year. Most of Fisher’s budding liberal-arts curriculum survived, and lives on in spirit to this day, thanks to faculty who took it to heart. 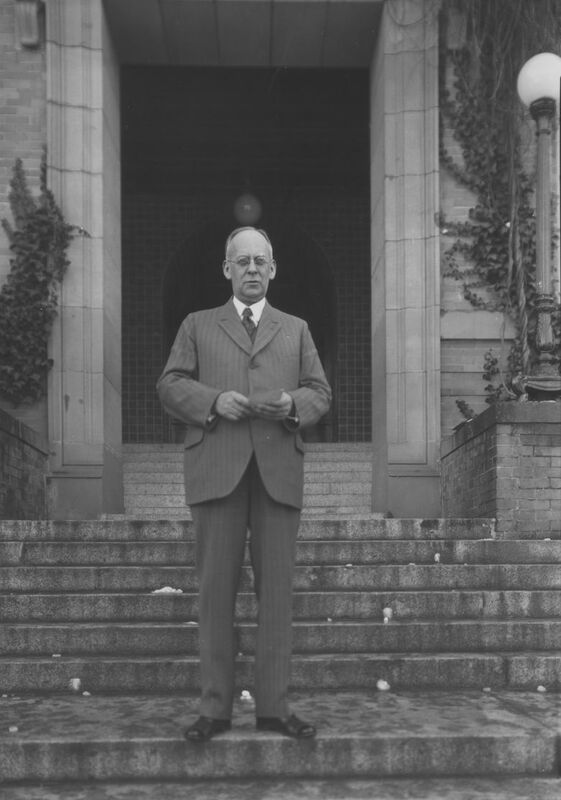 But in its haste to move on from the painful incident, the school, now 15,500-student Western Washington University, essentially buried the story of one of its most-important, little-understood leaders. But in 2013, a touch of serendipity tore the dusty cover — literally — off the Fisher case, allowing it to be examined in fresh historical light for the first time in eight decades. 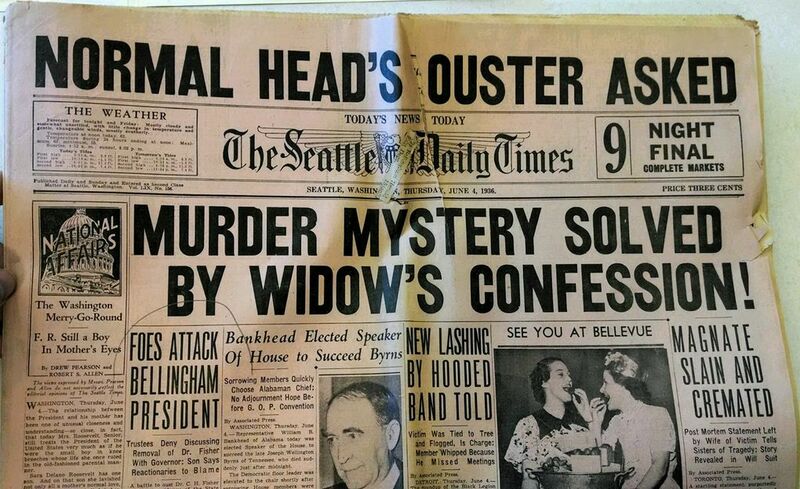 THAT YEAR, a dusty box of files, originally discovered around 2000 in the basement of The Bellingham Herald, made its way to a regional state archive near Western’s campus — rescued by a then-employee who thought the files were bound for a recycling center. 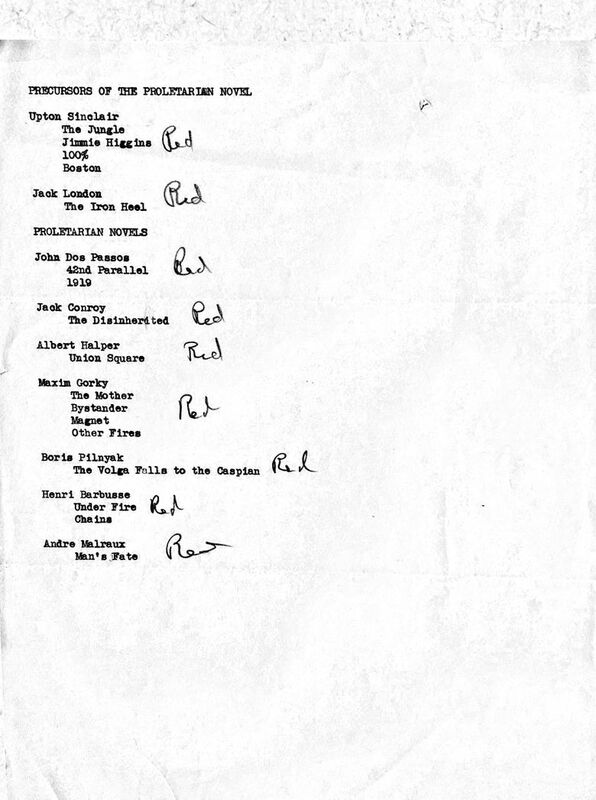 That archive long has been home to other documentation of the case, including materials left by the scorned and heartbroken Fisher on his way out of town. The new documents provide, finally, a glimpse into the true mindset of the other side. 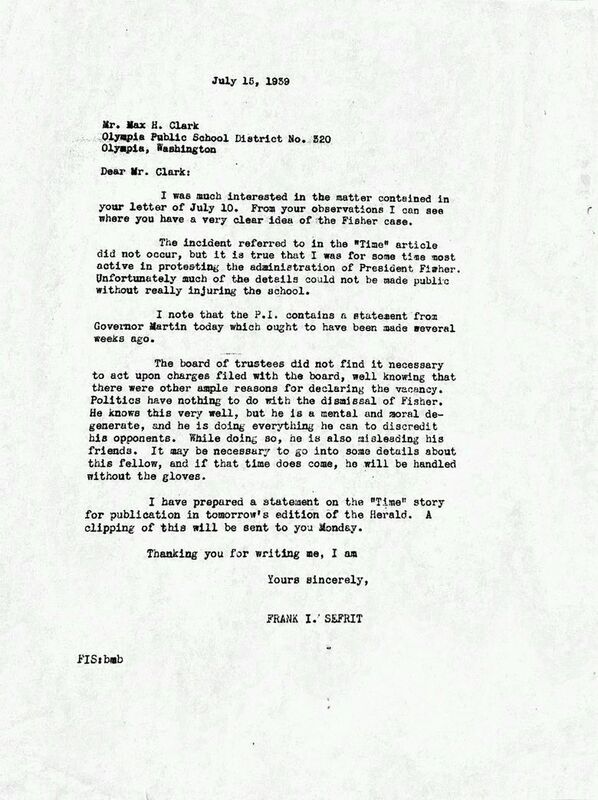 They amount to the working strategy files of Sefrit’s group, revealing a conspiracy more calculated and broad-based — and arguably more historically important — than previously known. 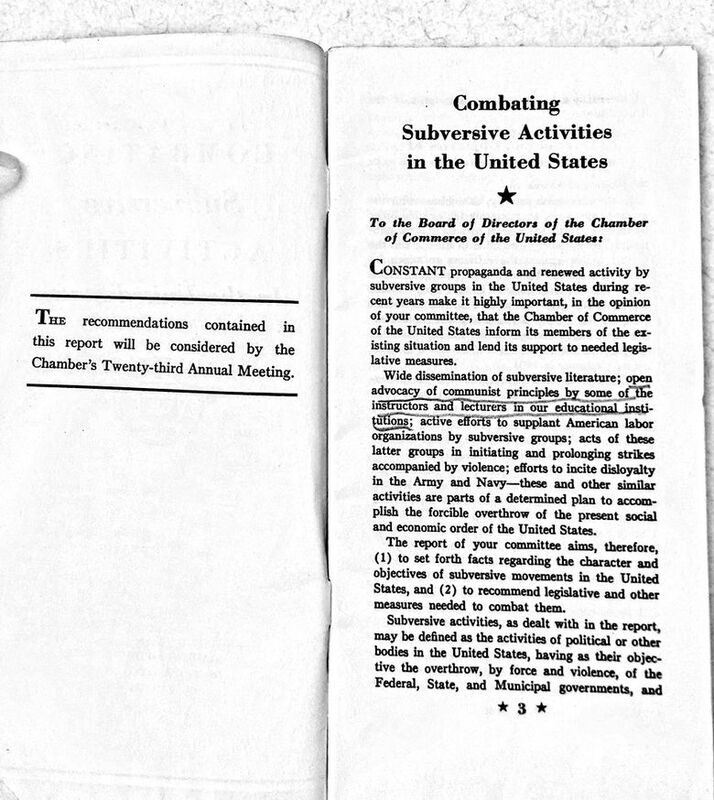 Included in the several-hundred-page collection are the things one would expect to find repeated in files of a determined Red-baiting group of the period: publications of right-wing organizations such as the Daughters of the American Revolution and the “Americanization Committee” of the American Legion; a pamphlet, “Combating Subversive Activities in the United States,” published by the U.S. Chamber of Commerce; notarized affidavits from volunteers sent to spy on “seditious” speakers at campus assemblies; lists of “radical” speakers who had addressed students as well as “Red” books found on library shelves; newspaper clips detailing other “Red” hunts on campuses (most from newspapers owned by William Randolph Hearst, who was waging his own Red Scare on campuses across the nation). The collection also contains Sefrit’s handwritten notes from what appears to be a series of strategy meetings. 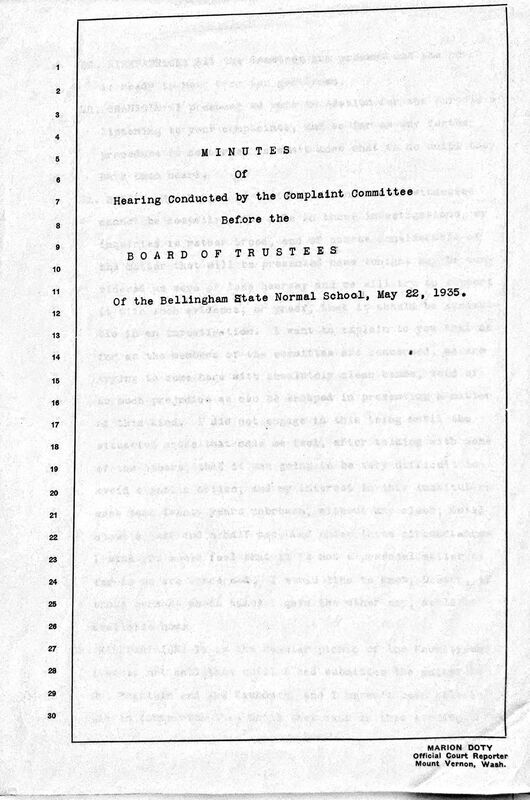 The true gem in this historical treasure trove, however, was a complete surprise: an 80-page typed, original transcript of that infamously secret May 1935 hearing before the trustees. 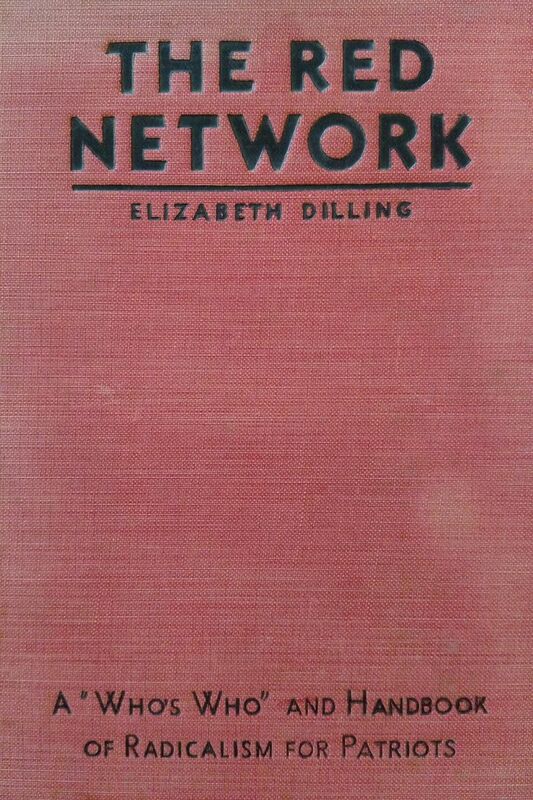 It is the only known copy. Reading the transcript — dotted by Sefrit’s handwritten notes, for later digestion of the governor — takes one back to the time, place and intense passion of the scandal. It reads in places like a screenplay, featuring two uncommonly eloquent ideological warriors: Fisher arguing passionately for what would become the country’s progressive future, Sefrit staunchly defending its stubborn conservative past. With an acerbic tongue that matched his cutting newspaper-editorial voice, Sefrit hammered away at Fisher’s alleged transgressions with the practiced fury of a prosecutor. Some of the charges were picayune, perceived slights such as failure to properly display the American flag on campus. Others cut to the heart of the matter: Of 26 speakers invited to campus in the preceding three years, only one could be construed a “patriotic character,” Sefrit charged. The student body president ran a “Social Sciences” club that had invited a member of a Red organization, the League of Industrial Democracy, to a meeting. 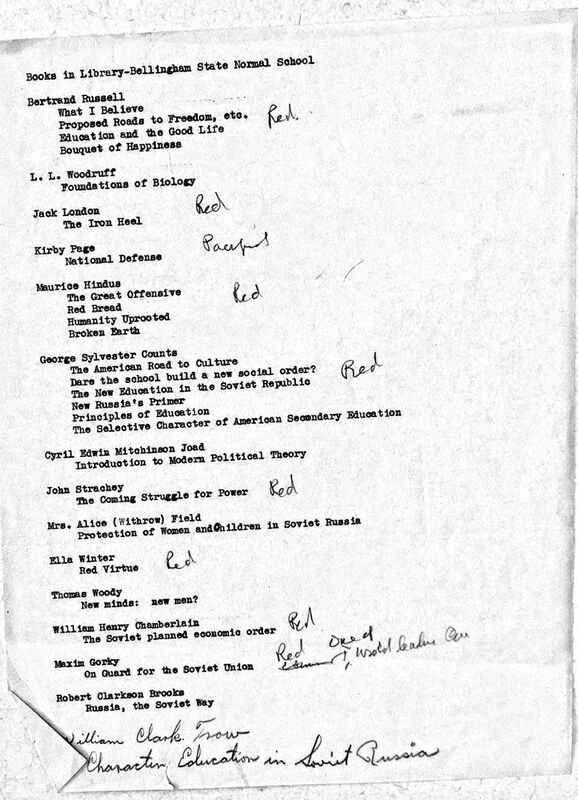 The campus library was polluted by “un-American” books by peace activist Kirby Page, education reformers George S. Counts and John Dewey, Russian writer Maxim Gorky, and muckraking leftist journalists Upton Sinclair and Lincoln Steffens. 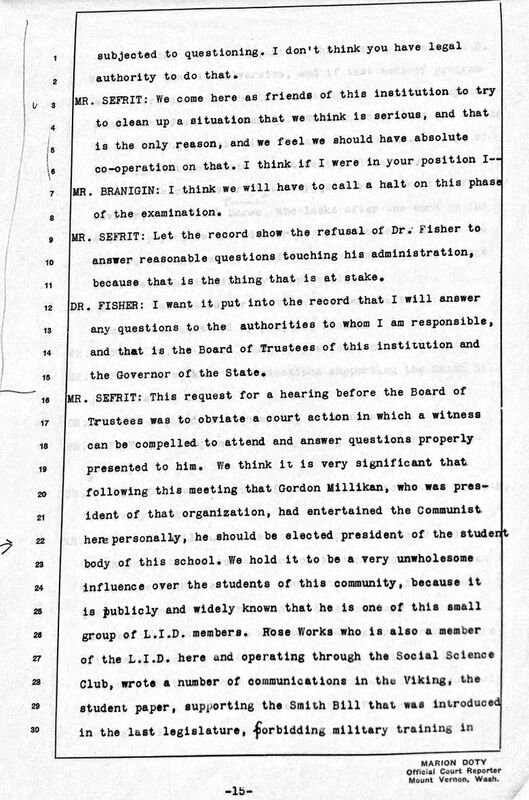 The overarching complaint, however, was that Fisher, himself, was a commie dupe, doing the bidding of Marxists such as Columbia University’s Counts, a leading socialist educator at what Sefrit termed “ … the Reddest, most un-American educational institution” in America. 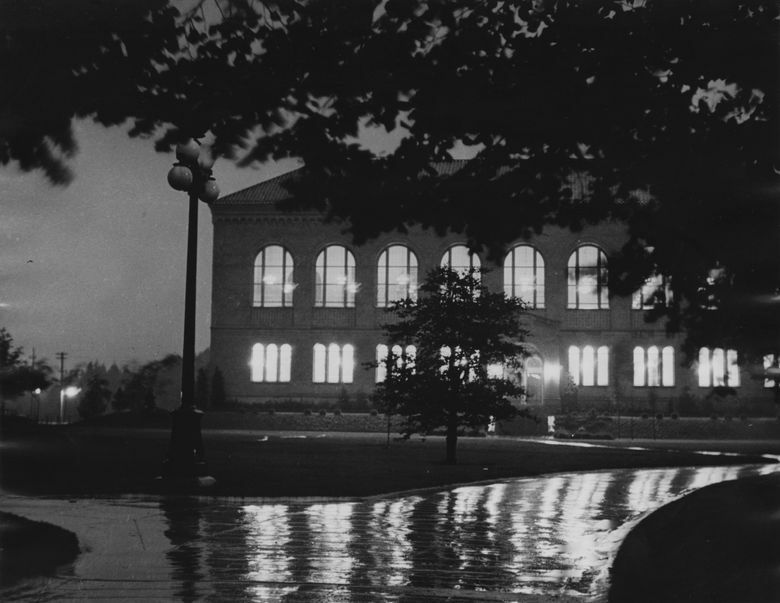 On they went, late into the spring night in the building now known as Old Main, arguing definitions of religious and academic freedom, sedition and loyalty, pacifism and patriotism, and, specifically, “indoctrination” versus education. • Restating the obvious, Fisher, a political liberal, was not a communist, and certainly not an atheist. Sadly, his bold, successful gambit to make his campus a national leader remains overshadowed by his ignominious exit. • The Sefrit group was larger and more organized than originally believed. 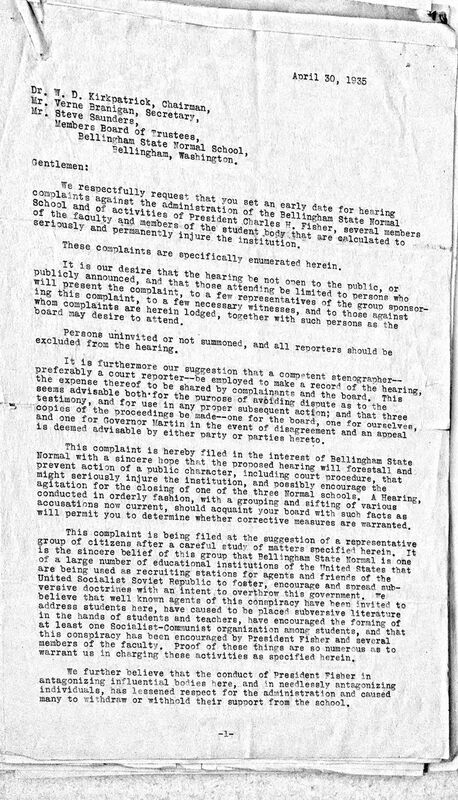 The group’s “charges” in 1935 were signed by only Sefrit and five other local men. 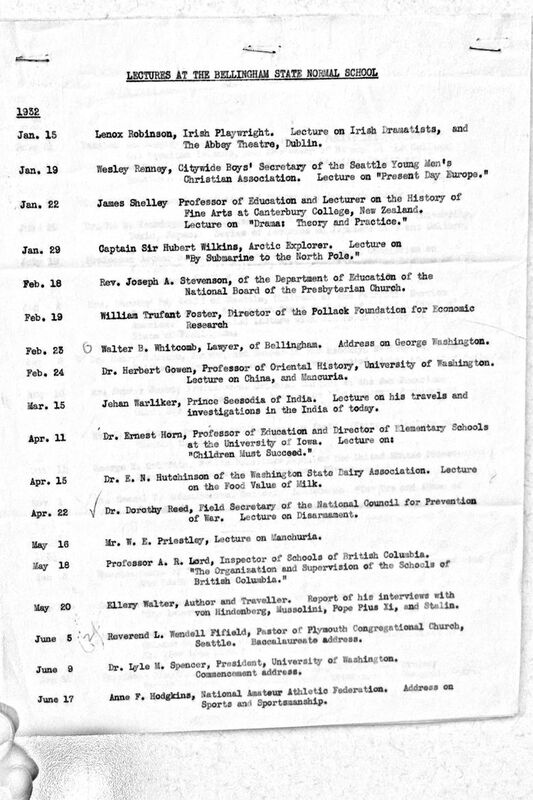 Sefrit’s notes add another seven names, including one especially intriguing person — Frances Payne Larrabee, a widely respected business and civic leader, philanthropist and wife of Fairhaven co-founder Charles Xavier Larrabee. The full extent of her involvement in the Fisher case remains unknown. 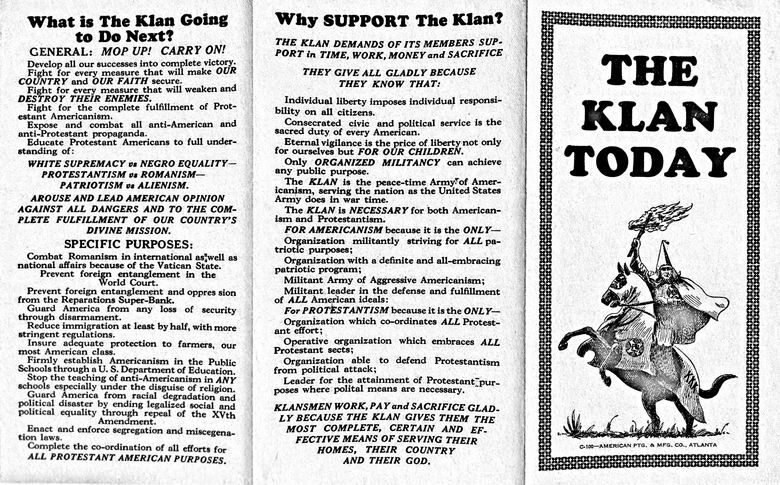 • Motivations in the anti-Fisher group, long a source of speculation, were varied; members ranged from jilted ex-employees to committed ideologues (direct KKK influence seemed negligible). Fisher, never one to back away from argument, was beloved on campus, but had created a handful of sworn enemies off it. Political vengeance was in the air, and Fisher personified “progressive” among those incapable, or unwilling, to draw a line between the word’s meaning in education and politics. 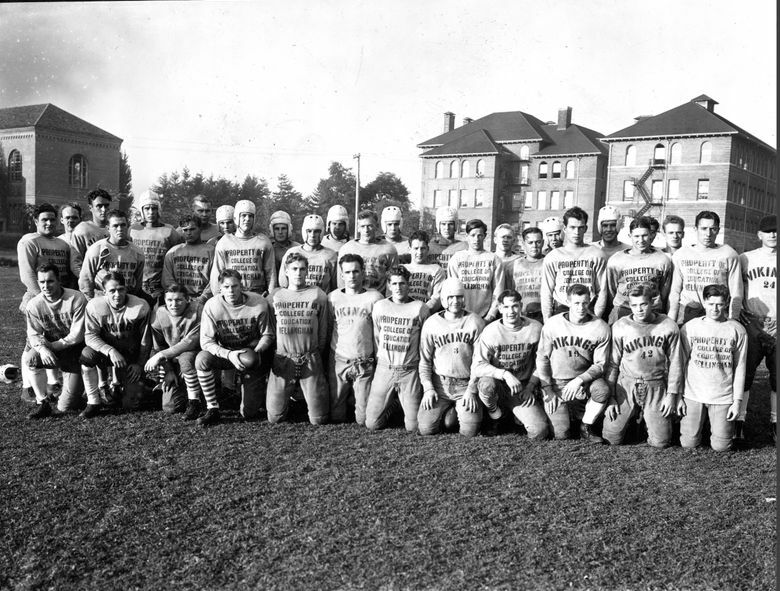 • The “superpatriot” leanings of the Sefrit group were not jarringly out of place in Western Washington in the mid-1930s: Anger over the 1919 Seattle General Strike, reawakened by a 1934 longshoreman’s strike, lingered among conservatives. And true communists challenged Gov. Martin from his left political flank. Passion on both sides was fanned by the then-radical reforms of the New Deal. 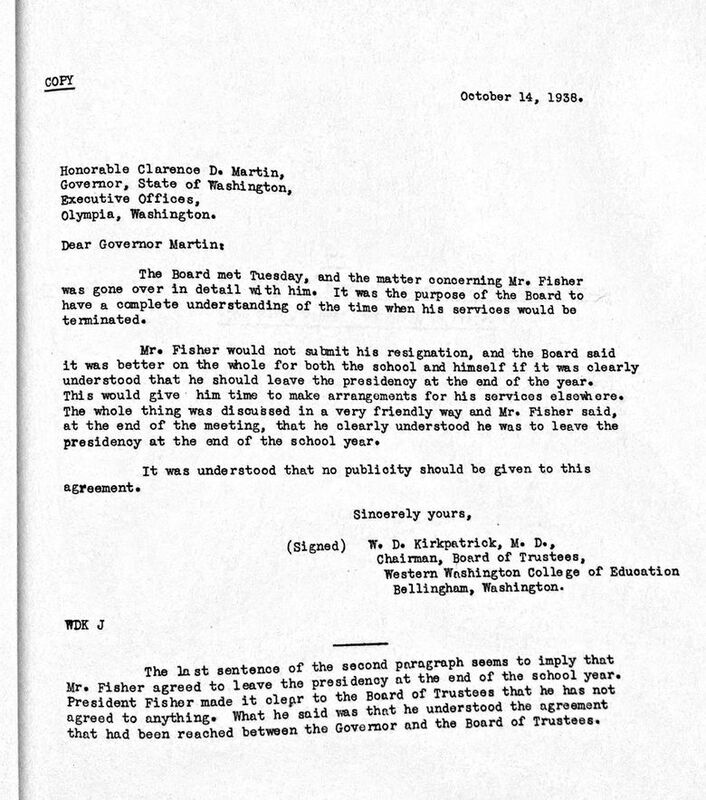 In the end, Fisher’s ouster unfolded remarkably close to Sefrit’s original scheme: He planned to present a legal-style case at the 1935 hearing. If and when the board exonerated Fisher, he would deliver his dossier to the governor, who under state law at the time could fire the board and appoint new trustees charged with firing Fisher. 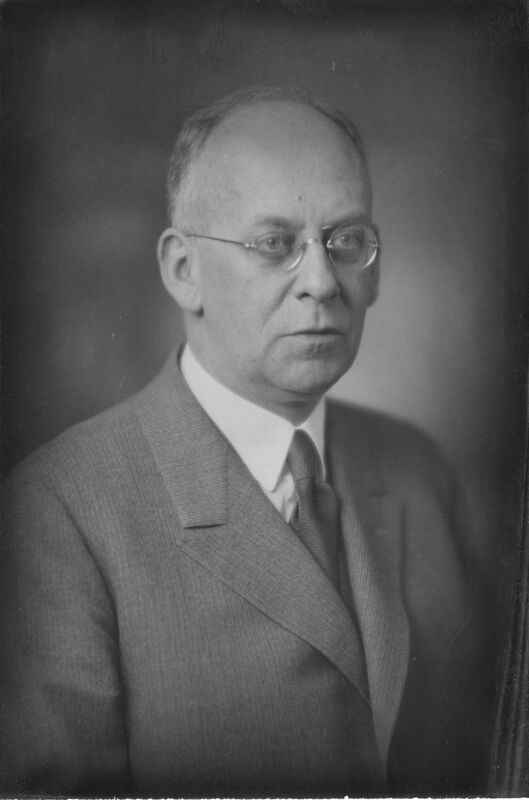 Facing that ultimatum, the same three trustees who had vociferously defended the popular president in 1935 finally signed on to Martin’s excuse that Fisher had simply worn out his welcome after 16 years. Sefrit, who died in 1950 — leaving his sons in control of the newspaper — later had an imposing mountain in the Mount Baker area named in his honor by the U.S. Forest Service, in recognition of his long community service. It remains Mount Sefrit today. 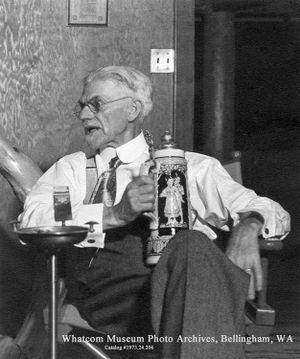 Fisher, blacklisted from his life’s passion, got politically involved after his firing, eventually serving as an officer of the ill-fated Washington Pension Union, itself embroiled in a Red Scare scandal during the 1948 Albert Canwell Hearings at the University of Washington. 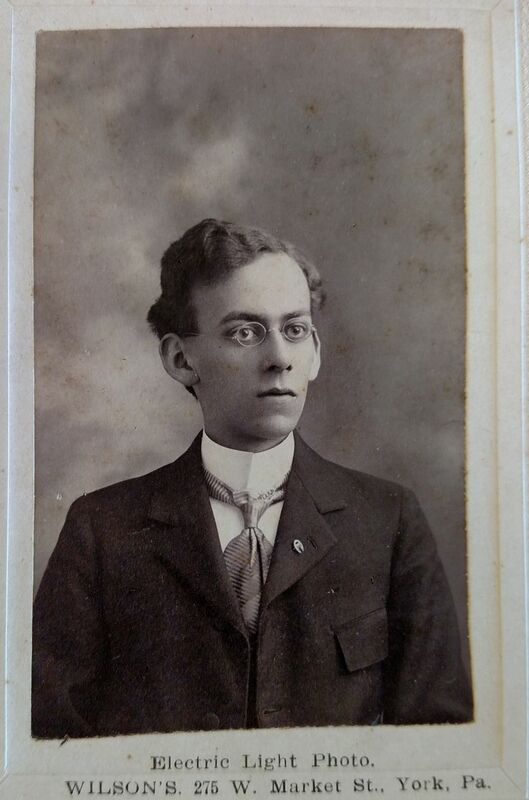 He died in 1964 at a Des Moines retirement home. A Washington governor can no longer summarily fire a university regent or trustee without probable cause — and a court hearing, if requested. That change, urged by Fisher after his dismissal in the interest of insulating higher education from politics, came years too late to help him. Western Washington University has never provided an official account of Fisher’s firing, at least in terms of the minutes from its board of trustees. 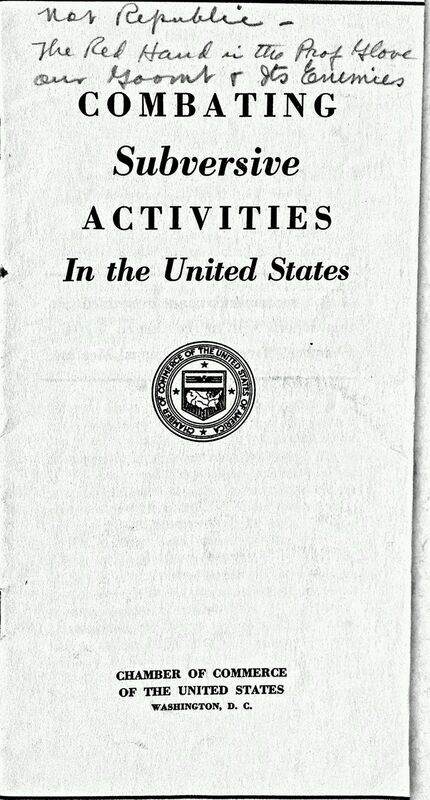 One month in 1938, the board is going about its business, even discussing a modest raise for the president. The next month, it was off looking for a new one. Ron Judd is a Pacific NW magazine staff writer. He is a 1985 graduate of Western Washington University (history/journalism) and an occasional WWU adjunct instructor. This article is adapted from his research on the Fisher case for a thesis in a master of arts in history program at the University of Nebraska-Kearney. Reach him at rjudd@seattletimes.com or 206-464-8280. On Twitter @roncjudd.